The most important and fundamental part of the day of a Jewish Wedding is in fact arguably the signing of the Ketubah. 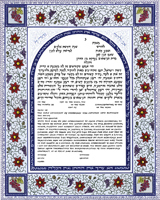 The Ketubah essentially is the marriage contract in Jewish law. In a Jewish marriage, the Chatan accepts upon himself various responsibilities which are detailed in the Ketubah. His principal obligations are to provide food, shelter and clothing for his wife, and to be attentive to her emotional needs. The protection of the rights of a Jewish wife is so important that the marriage may not be solemnized until the contract has been completed. The document is signed by two witnesses, and has the standing of a legally binding agreement. The Ketubah is the property of the Kallah and she must have access to it throughout their marriage. The Ketubah is signed during the Jewish Wedding Ceremony. The reading of the Ketubah acts as a break between the first part of the ceremony — Kiddushin (“betrothal”), and the latter part — Nissuin (“marriage”). The honour of reading the Ketubah is normally reserved for a Torah scholar — one who can fluently read the Aramaic text – i.e. often the rabbi and it is read under the chuppah. After the Ketubah is read, it is handed to the groom who gives it to the bride. The Ketubah is then put in a safe place for the duration of the wedding. It may be printed; more often, it is hand written in beautiful calligraphy and often written amidst beautiful artwork. The text is over 2,000 years old, and the present form was fixed in the eighth or ninth century. The Ketubah is to be framed and displayed in the home. The Ketubah belongs to the woman. There is another way to view the Ketubah: think of it as the first prenuptual contract! Are you looking for that special, elegant ketubah to grace the walls of your home forever? Here you will find exquisitely designed ketubot that are available in a variety of texts. Have your ketubah personalized by the artist, for a beautifully calligraphed text. Shipping to the UK is only $25.